CHIANG RAI, Thailand—Four of 12 schoolboys have been rescued so far from a flooded Thai cave after divers launched a daring and dangerous mission to free the children and their soccer coach, who were trapped underground for more than two weeks, Thai officials said. Thirteen foreign divers and five members of Thailand‘s elite navy SEAL unit are trying to bring the rest of the boys—some as young as 11 and weak swimmers—through narrow, submerged passageways that claimed the life of a former Thai navy diver on Friday. A helicopter flew some of the boys to the nearby city of Chiang Rai where they were taken by ambulance to hospital. Their ordeal has drawn huge media attention in Thailand and abroad, and getting the boys out safely could be a boost for Thailand‘s ruling junta ahead of a general election next year. “Today is D-Day,” Narongsak Osottanakorn, head of the rescue mission, had earlier told reporters. 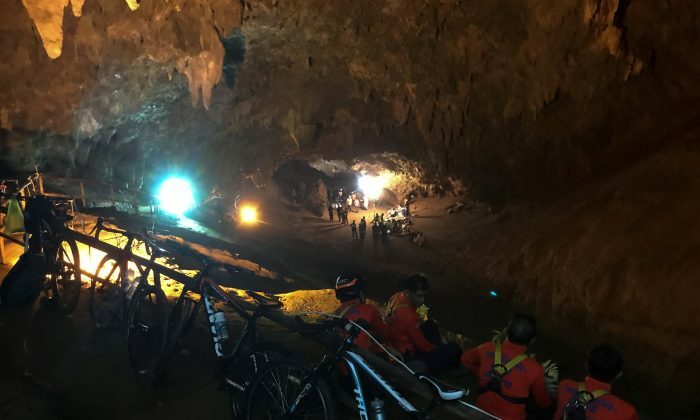 Bursts of heavy monsoon rain soaked the Tham Luang Cave area in northern Chiang Rai province on Sunday and storms were expected in the coming weeks, increasing the risks in what has been called a “war with water and time” to save the team. The boys, aged between 11 and 16, went missing with their 25-year-old coach after soccer practice on June 23, setting out on an adventure to explore the cave complex near the border with Burma and celebrate a boy’s birthday. Rescuing them all could take three to four days and depended on the weather, an army commander involved in the mission had said earlier. Of the 13-strong foreign dive team—mainly from Europe—three were escorting the children, while the remainder were positioned along the dangerous first kilometer stretch, where the boys will have to navigate through submerged passageways in some places no more than two feet (0.6 meter) wide. Thirteen medical teams were stationed outside the cave—each with its own helicopter and ambulance—one for each of 12 boys and their coach. After an initial assessment at the site, the plan was to airlift the boys to a makeshift helipad close to the Chiang Rai Prachanukroh hospital, some 70 km away. “The teams here are happy the boys are being rescued but also anxious about the severity of the boys’ conditions. We’re under a lot of pressure,” she said, declining to be named because she was not allowed to speak to the media. The area outside the hospital was cordoned off with police patrolling the area, said a Reuters reporter at the scene. Down the street, a loud speaker told vendors to “keep off the road” and to “not obstruct the transfer mission”. Prime Minister Prayuth Chan-ocha planned to visit the cave site on Monday, a government spokesman said.